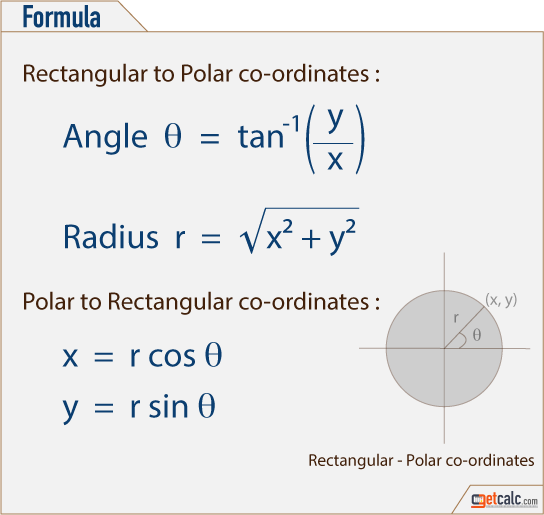 getcalc.com's rectangular to polar coordinates calculator is an online basic geometry tool to perform conversion between cartesian (x,y) and polar (r,θ) coordinates, in both US customary & metric (SI) units. Rectangular (x,y) - Polar (r,θ) Coordinate system are the two dimensional plane to determine the position of points. Rectangular - polar coordinates conversion is a method of converting point (x,y) on the cartesian plane to point (r,θ) in polar plane.